The Rollei Magic (1960-1962) is a delicious TLR with super powers including automatic exposures and incredible portrait-taking abilities. 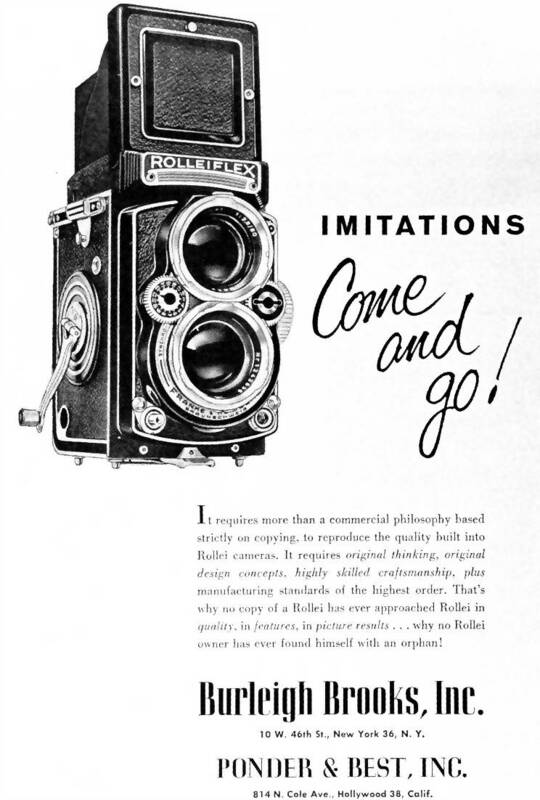 This was the first TLR camera to use an automatic exposure. The first iteration was produced from 1960-1962 by Franke and Heidecke of Braunschweig, Germany. One of the main drawbacks of the model is the fragility of the meter. Since the exposures are all automatic, if the meter breaks, the camera is essentially useless (although it would make for a pretty fancy paper weight). F&H created the Rollei Magic II (from 1962-1968) as a response to this problem, making the controls partially manual. The lens is Schneider Kreuznach Xenar 75mm f3.5, and the shutter Prontormat S 1/30 to 1/300 (it also has a Bulb setting). The original camera came with an additional mask set, so it can take either 12 shots at 6×6cm (squares!) or a more economical 16 shots at 4×5.5cm. Setting up a shot is the same as any other TLR, just without the exposure option (thus the Magical-ness). Simply set the film speed, open the hood, focus, set the aperture, snap, crank, and repeat. My grandfather used the camera in the 60’s and I was pleasantly surprised to see that it’s still in great shape, producing images as clear as when he used it. I’ve only shot 2 rolls with it so far, but I’m totally addicted! Shooting on the street, I’ve never had as many random people come up to me and ask how the camera works, how old it is, and if they can look into the frame finder. Though I’ve shot in both the square and rectangular formats, the 6×6 seems like more fun and in keeping with the Rollei tradition. Provided the meter stays in shape, I’ll be using this camera for a long time! via Rollei Magic…Oh So Magical – Lomography. Would love to have one of those! Great photos! thanks. thats a fantastic photo stream…. Many opine, as is often the case, that TLR cameras are perfect for street photography as you’re not looking directly at your subject. I’ve got a Hasselblad 500CM + 80mm Planar with folding finder, but would not risk taking it out onto the streets. Instead I use an ancient 1965 Nikon F with a waist level finder instead of the standard eye level prism. Pentax LX to name a few. If you can get hold of a Nikon F3 and the WLF for it, you can use autoexposure with waist level shooting as the metering on the F3 is in the body.